The March 2019 NAHO Newsletter is now available for download. This issue features articles regarding upcoming elections, the upcoming NAHO Conference in New Orleans, and helpful topics ranging from ex-parte communication to stress management. Get your copy here! You can also see all of NAHO's past Newsletters in the archive. The November 2018 NAHO Newsletter is now available for download. You do not want to miss this one! Get your copy here! The May 2018 NAHO Newsletter is now available for download. You do not want to miss this one! Get your copy here! You can also see all of NAHO's Newsletters in the archive. Several years ago, NAHO members who conduct Human Services hearings were interviewed about how they view their roles by Karen R. Brown, then a social work doctoral candidate at the University of Connecticut and a hearing officer at the CT Dept. of Social Services. Ms. Brown reported on the progress of her work at the NAHO 2014 Annual Conference in Charleston. Ms. Brown, now Dr. Karen McLean, is an assistant professor in the Social Work Department at Western Connecticut State University. Congratulations Karen! We are glad NAHO was able to assist you in your study of these hearing officers who play a critical role in public assistance administration. NAHO congratulates Dr. Horace Buckley and Timothy Monroe on becoming Certified Hearing Officials. Judge Buckley is a hearing officer for the Gwinnett County Schools, GA. He has been a hearing officer for 9 years. He is a graduate of Southern University (BSEd), the Ohio State (Med) and received his doctorate from Nova Southeastern University. Judge Monroe is hearing officer and Assistant Director of School Safety for the Forsyth County Schools, GA. He has been a hearing officer for 5 years. He is a graduate of North Georgia College (BBA and MEd) and the University of Georgia (EdS). Both gentlemen have satisfied NAHO's rigorous certification criteria. Becoming a Certified Hearing Official or Certified Administrative Law Judge is a nationally-recognized hallmark of excellence and professionalism. The November 2017 NAHO Newsletter is now available for download. Get your copy here! You can also see all of NAHO's newsletters in the archive. NAHO congratulates the following Judges on their recertification as Certified Hearing Officials: Kayla Adams, Janice Deshais, Jim Gerl, Karen Gorman, Peter Halbach, Iris W. Olulenu, Diana F. Ragsdale, Jimmy Stokes, Pilar Vaile, Recertified ALJ, and Norman Pentenaude, Recertified ALJ. Recertification demonstrates a commitment to professional development and excellence in administrative hearings. NAHO congratulates the following Judges on becoming Certified Hearing Officials: Richard H. Byrd, Jr., Darlene Davis, Mary Dempsey, Felecia A. Ford, Gwendolyn Gordon, Dijaria Henderson-Greene, James Huntley, LaShawn M. James, Jeanine McCannon, Rodney Moorehead, Alice Newton, Monisola Ogunfiditimi-Tamba, Rebecca Ophus, Tracia Rountree, Pamela M. Smith, Colleen Ulrich, Suzanne Windor, and Rebecca Ophus, CALJ. All of these Judges have satisfied NAHO's rigorous certification criteria. Becoming a Certified Hearing Official or a Certified Administrative Law Judge is a nationally-recognized hallmark of excellence and professionalism. 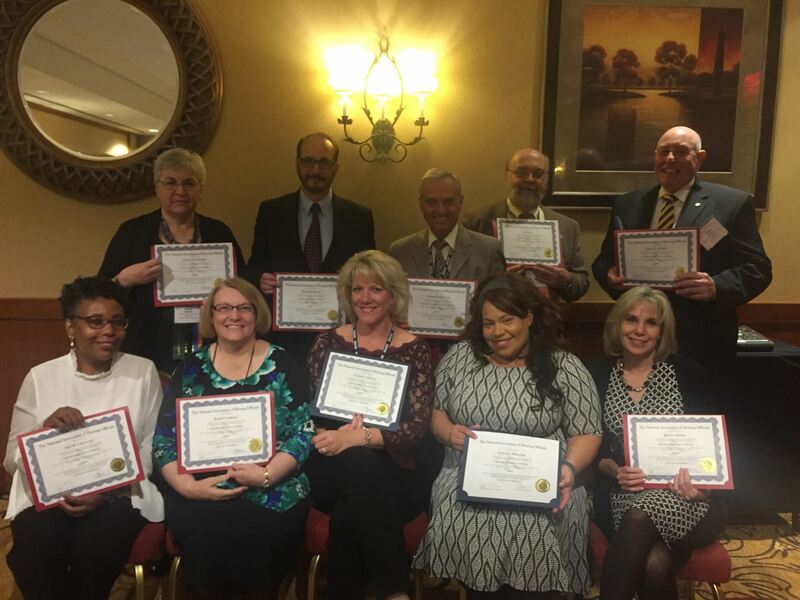 All of the Judges were honored for their achievement during NAHO’s 2017 Annual Professional Development Conference in Washington DC on September 12, 2017, and some were present and received their certificates during the banquet (as pictured). NAHO Hotel Rooms at Special Rate Ends August 15, 2017! This is a reminder that NAHO’s special rate for suites at the host hotel, Embassy Suites-DC Convention Center, are only guaranteed through August 15. After August 15, the rates go up to the hotel’s regular rates, which are considerably higher. If you have delayed making your room reservation in the hope that you will find a less expensive room near the host hotel, please be aware that NAHO reviewed the rates of all the hotels in that area and found this hotel’s rate for suites compared favorably with other hotels’ rates for regular rooms. In addition, the Embassy Suites provides a complimentary made-to-order breakfast or a breakfast buffet each morning as well as complimentary drinks and snacks at the Evening Reception. Embassy Suites’ Passkey Reservation System has been programmed so that NAHO conference attendees can easily make room reservations at NAHO’s special rate. The website address is: https://aws.passkey.com/go/NAHODC2017. Reservations may also be made by calling toll free 1-800-HILTONS. Please refer to the National Association of Hearing Officials Conference, September 10-13, 2017. To confirm a sleeping room within the NAHO Room Block, the sleeping room must be secured with a valid credit card provided by the guest attending the event, along with a first night’s deposit BY AUGUST 15. NAHO has a $500 Scholarship from the NJC that will expire August 31, 2017. The NJC has a few classes that you might find useful before the scholarship expires. Given the limited time we have with the scholarship, we will offer the scholarship on a first come, first serve basis. Please click the link below for more information on classes, locations, and costs, as well as contact information with NJC. For more information, please contact Toni Boone at toni.boone@naho.org. NAHO no longer issues membership cards to new members or renewing members. Actual membership cards are no longer necessary, as we can now confirm membership in our membership data base. To verify membership, log in at naho.org. If you are already a member and don't know your password, or if you are a new member and need to set a password, you can do so at http://www.naho.org/Sys/ResetPasswordRequest. If you have questions or difficulty setting or resetting your password, contact your Regional Representative.